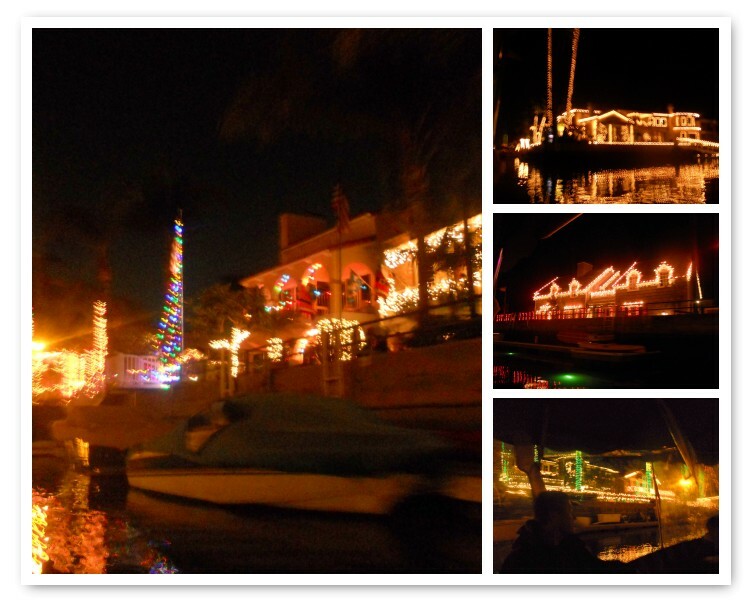 My favorite Christmas Tradition: a boat ride through Naples. We have lots of family traditions this time of year, but one of my favorites is looking at the Christmas lights by boat. We live near a neighborhood in Long Beach, California called Naples. Naples is an island neighborhood, and in the center of the island is a loop of canals. Each year we rent a covered Duffy Boat on the Friday that the schools finish up for Winter Break. 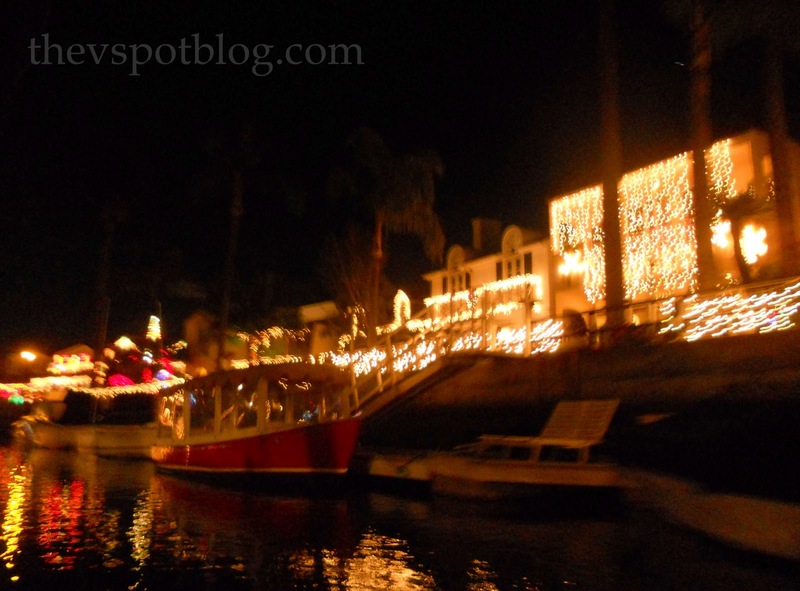 That Friday always seems to coincide with the weekend of the Boat Parade, so everything is decorated to the nines. The houses along the canal go all out with their Christmas lights. 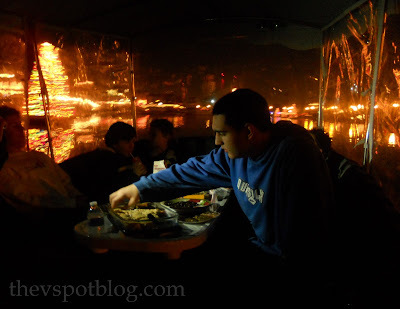 We cruise up and down the canal, looking at lights, waving to other boaters and occasionally stopping to listen to the gondoliers sing to the passengers in their gondolas whenever they go under a bridge. It’s very cool. We used to walk the sidewalk above the canal to see the lights but the Christmas that I was pregnant with Grant, Handsome Hubby rented an electric Duffy Boat and we saw the lights from the water. We’ve been going on the boat every year since. Sometimes we go just with our family, sometimes we bring along some friends. 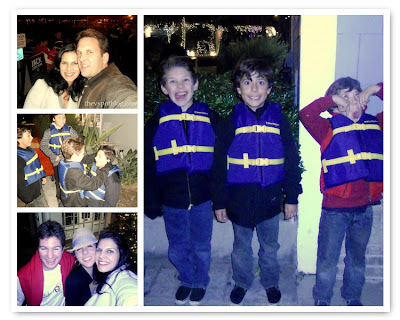 This year Grant’s best friend Jake and his family came along. Fortunately for Jake and Grant, we parents are cut from the same cloth and we love spending time with them. No matter how many come along with us, we always bring along yummy snacks & treats, lots of hot cocoa for the kids and a good bottle of wine or two for the grown-ups. My camera an Instamatic POS and I’ve asked Santa for a Canon Rebel for Christmas, so all of these photos just don’t do these homes justice. They are amazing. The lights reflecting off of the water is just so beautiful. I love that each year the city also creates a line of floating trees in the bay. It’s gorgeous. We cruise around for about two hours, laughing, talking, sipping yummy drinks and making memories. 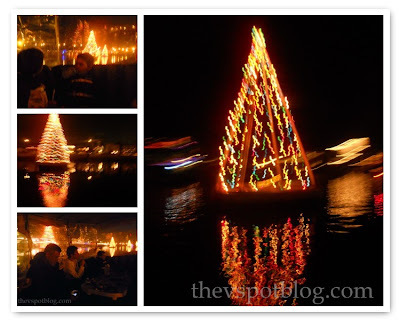 Each Christmas season, this traditional boat ride is one of the things I look forward to the most. Tell International Delight what your favorite holiday tradition is for a chance to win a $200 Target gift card from BlogFrog.